"I'm depressed. I feel like I've got a giant dark cloud hanging over my head. No matter how good my art is, it's simply not selling. I don't get it. I know painters that are not as good as I am who are selling more art. Why? What am I doing wrong? How long will I have to wrestle with this? I can't seem to find a solution, and I've tried everything. I tried advertising, and it didn't work. I've done art shows, and people just pass by. It's now starting to affect my work because it's robbing me of all the joy of painting when no one seems to want what I do. Is seems like day after day, this problem plagues me and brings sorrow to my heart. "What am I doing wrong? I need the answers. Painting alone isn't enough. I need that validation from knowing others want what I've put my heart and soul into creating. I need to know others appreciate my art enough to buy it. Plus, I want to paint full-time, which means I need to sell art in order to escape my go-nowhere job. I know there's got to be a solution. I've tried everything. I know there is answer, and I'll be elated when I solve it. I can see success, I can taste it, I know it will come ... but it's hard to believe it when I've seen no evidence, and this problem is consuming me." I hear from a lot of artists who are at the end of their rope. I don't mean suicidal, but discouraged enough to give up painting, which they truly love, or to give up trying to sell their art. Artists who either have to solve the problem of why their art isn't selling or go back to a career they don't love, or just continue to struggle. I also hear from artists who were counting on selling paintings to fund their retirement, and others who can't survive financially much longer without selling their art. The worst part is that their minds start to play tricks on them. They start believing there is no hope, believing that their artwork isn't as good as their friends or family tell them it is. They think in their hearts there is no solution, or that others are just more talented than they are. They start feeling like they don't deserve success and dread the idea of more rejection. I'm here to tell you that it's not you, and it's probably not your art. You and I have seen a lot of bad artists become giant sellers, creating work we don't respect. We also know great artists who are better than we are who don't have success selling their work. Most likely the problem is your marketing. It's my mission in life to help artists sell more art. I can't stand it when artists don't see their dreams come true, which is why I'm putting my decades of experience in other industries toward helping artists solve their greatest challenge: how to sell more art. It's proven to succeed. In the last 10 years I've had contact with thousands of artists, I've coached hundreds and hundreds of them, and most are really good at their art, yet most of them have problems selling their work. Most have attempted some form of marketing and failed, thrown their money away, seen no results, and become deeply discouraged. I have two really good artist friends. Both were depressed because their art was not selling. I sat with both for dinner one night and told them exactly what they needed to do. I walked them both through a basic plan. Both artists told me all the reasons I was wrong, told me that it wouldn't work and how it wasn't what everyone else does. One of the artists called me six months later to tell me he had tried everything else, and though he still thought I was wrong, he was out of ideas and decided to follow my advice. And a year later, he told me he'd had his best sales year in history. The other artist was convinced it would not work and kept painting for a while, but had to give it up under pressure from his wife to produce a reliable income. He took a job he hates and that doesn't use his creativity. He sits at a desk, has a long commute, and is in a totally unexciting industry. Now, three years later, he tells me he is miserable and wishing he was painting, but he's still unwilling to do what it takes. Which artist are you most like? The one who is willing to try something new? Or the one who assumes nothing will work? Any teacher will tell you they have prize pupils. Rarely does everyone listen to everything I advise them to do; most pick out one or two things to help them begin to sell more art. But one person who attended my first Art Marketing Boot Camp™ two years ago followed most of my advice. I don't want to embarrass her so I'll keep her name out of it (available upon request), but here are her exact words from an e-mail I received on March 8. Profits up 135% in 2013 over 2012, and 183% over 2011 (entire year). First quarter profits up 138% this year over last. 9 workshops planned this year through mid-Nov. Many are full with waiting list. Newly introduced workshops are filling in record time. In the past 12 months, articles in PleinAir magazine, Fine Art Connoisseur, and two others. Another in the works. These are NOT paid editorials (meaning because I bought ads). In one year, sold over 200 copies of my first book. - Invitations to the nation's biggest plein air INVITATIONALS. No longer applying to events due to demand of time. They are approaching me. Major gallery connection with yet another top gallery this year. Upcoming DVD to be produced. All because I took your marketing advice. Can this kind of success happen to you? Absolutely. But it's not easy. Nothing good ever is. 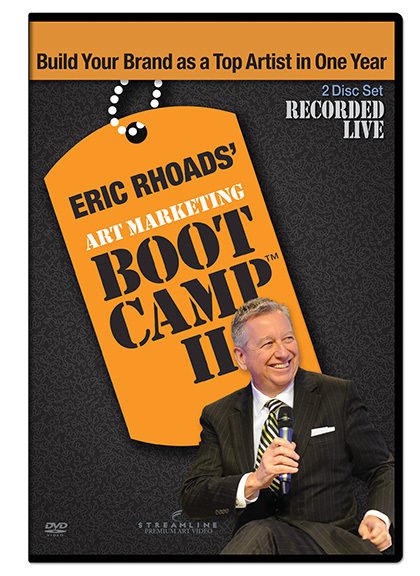 In fact, the majority of people who attend Boot Camp or buy my DVDs will never be willing to do what it takes. If you want to succeed at selling your art and changing your life, it requires that you think differently (the definition of insanity is repeating the same behavior and expecting different results), create and follow a simple plan, and follow that plan religiously. You can grow your art sales as big as you can dream. My system can work for slow, steady career building or, if you're older and want to speed up the process, it can bring rapid success. But marketing is something most artists refuse to do, and most completely misunderstand it. That is why they are not seeing the success they need. You invest thousands of dollars in a workshop to make progress in your painting. You'll invest hundreds of dollars in DVDs to improve your art. Yet most artists want to be successful painters and won't invest in learning how to market. You need to invest where you need success, which may well be in marketing your art. Imagine your life without the stress of not knowing how you'll pay your expenses. What if you were able to be a full-time artist and live the dream of travel, attending and participating in events? What if galleries were chasing you rather than your approaching them and risking rejection? What if you were being invited to events as a special guest, people were lining up to attend your workshops, paintings were selling, and your financial worries were gone? If you are living with that dark artist cloud over your head and want to break out of it, you can. It is possible, and I can show you the solutions. I'm not one of these people who is going to tell you that if you believe it, you can do it. Though mindset and positive thinking do matter, without a system, they are just thoughts. I know it seems impossible at this moment. We've all been there. I can remember a time when I survived on peanut butter sandwiches because I couldn't afford any other food. I didn't think my plight would ever end. I've been down and out, been broke and on the edge of bankruptcy two different times, and yet I've recovered, used what I've learned to build successful enterprises, and have had some of the world's great mentors teach me their secrets. Today I'm living in my dream job because I get to travel the world to see art and to paint, attend events, get my portrait painted by the world's great portrait artists, jury shows, spend days shooting art videos with top painters, all while doing what I love, which is writing and running my magazine business. Though I've been blessed and had a lot of good luck, I also know that most of what happened was by design because I practice what I preach. I have a plan, and I follow it. The first step, they say, is always the hardest. Sometimes we have to bottom out before we take action to change our lives. The artist I mentioned above told me, "My husband was out of work, my work had not been selling, I didn't even have the money to make the trip to the Plein Air Convention to attend Marketing Boot Camp 1, let alone pay for the ticket to attend. Yet I found a way, and it was the absolute most important step in my career, which is why I return each year, even though I know I can buy it on DVD later. As you can see, my art sales are soaring. Though I'm the one who did the hard work, jumped in face-first to commit to following a plan, it was Art Marketing Boot Camp that gave me the step-by-step plan to success." 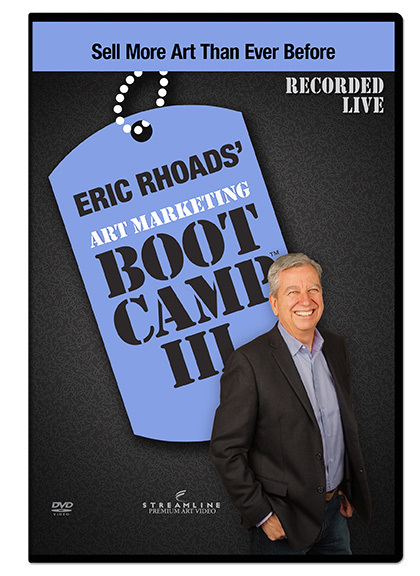 On April 7-11, I will present my third Marketing Boot Camp series live each morning during the Plein Air Convention. The artist above, and dozens and dozens of others, have told me that the Boot Camp alone was worth the entire cost of the trip and admission to the convention. They have seen their lives transformed because they are now selling art. This is an investment in your marketing education, and if your artwork is not selling and you don't know why, things will become clear to you after attending -- and you'll have specific action items you can make use of right away. The only question is whether or not you are really ready to make a commitment to selling more artwork. 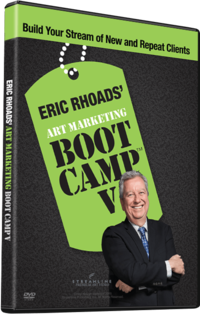 I've built Art Marketing Boot Camp as a series. I'll be presenting three new modules this year on three mornings from 6:30-7:45. Not only do things change from year to year, but I strive to learn new things by attending seminars and events throughout the year, meeting with top marketing minds, and experimenting with new ideas. One three-day seminar alone cost me $1,800, just so I'll have a new module to share on one of the three days. I'll distill the information down, convert it for artists, and present it to you during Marketing Boot Camp 3. You have my guarantee that if you follow the advice in this new series, you'll build on your current success dramatically. If you follow my full system, you'll double your art sales in one year or less. Marketing Boot Camp is just a tiny portion of the Plein Air Convention, and you don't have to be a plein air artist to attend. Each year we have portrait and still life artists at the convention. In fact Daniel a brilliant figurative artist is one of our faculty. They come for the experience, the chance for personal and professional growth, and the new friendships. Many are there for the convention; others come for Boot Camp but enjoy the convention as well. Everyone has a great learning experience and a great time. PS II: I've been told we have room for 40 more people to register at this year's convention. There is typically a lot of activity in the last couple of weeks and even a few walk-up registrations. It would probably be a good idea to secure one of those 40 seats ASAP.